Do you own a business or a job? Too many self-employed people confuse both. To celebrate the year’s successes I am closing out 2016 by presenting the TOP 5 Vlogs of the year (as voted for by you) in descending order between now and New Year’s Eve. At No. 4 we have my take on the VAST DIFFERENCE between being self-employed and owning a business. Self-employed is NOT Business Ownership necessarily. Too many people, too often confuse both and many jump from the relative security of the pay cheque into working for themselves, ‘doing their own thing’, ‘being their own boss’, by buying a ‘business’ only to wake up to the reality they have simply bought a job for themselves – one that for many doesn’t even pay them (for time invested) what they earned working for the man. In this week’s ‘Coffee with Colm’ I relate an experience I had many years ago when I was commuting to my job as General Manager of Bewley’s Grafton St. 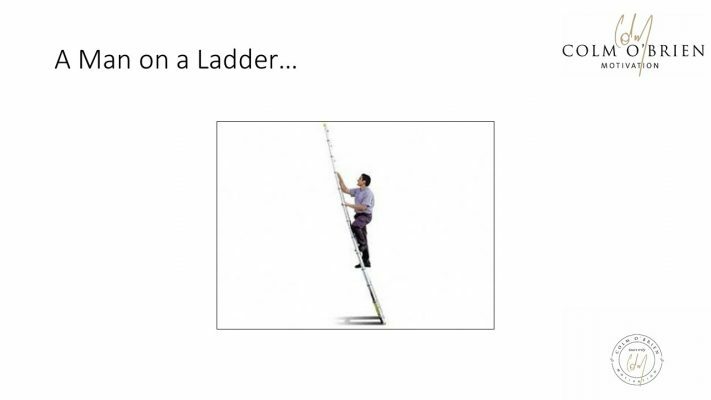 I was an employee, using my commute-time to study business principles, when I saw a man on a ladder washing windows. Immediately I began to question the theoretical difference between Self-employed and Business Owners. Through the intervening years I went on to prove the theory. This week I share those thoughts. It was one of those beautiful mornings in Dublin city, you know the type. The sun was shining, the sky was blue, seagulls circled above the Liffey, the smell of the Guinness hops roasting in St James’s Gate Brewery hung heavy in the air as the double-decker bus I was on shunted down the quays from Heuston Station in rush hour traffic. The year was 1991 and bus lanes hadn’t found their way to Ireland yet. I was listening to the Walkman I introduced you to earlier. Like a lot of people back then I had my headphones on to block out the outside world. Then, as now, they were worn by many different types of people, students, joggers, walkers, business people, and mothers with buggies. Then, as now, most people were listening to their favourite music whether on a cassette or via a local radio station. Then, as now, only a few people were using this amazing mobile technology to study. I was one of those few. So there I was minding my own business, using the necessary evil of rush hour traffic to my best advantage by turning otherwise wasted time into a tremendous opportunity to expand my thinking. I can’t remember specifically what I was listening to that morning but I know it was to do with business, the do’s and don’ts, the why’s and why not’s, the thinking that takes you forward vs. the thinking that keeps you stuck in a rut. I was enjoying the morning en route to my stop at O’Connell Bridge, from where I’d make my way across the river, up Westmoreland St, around College Green and up to my place of work, Bewley’s Grafton St. The bus shuddered to a stop at some traffic lights and outside the window I saw him, the man on the ladder. He was an older man and he moved with the ease of someone who knew his trade for many years. He was washing a first floor window by leaning from a rung high up on the ladder, trusting his safety to a teenage looking boy holding the ladder securely at ground level. But when I looked more closely I realized the young fella was in fact leaning back onto the ladder, legs and arms crossed one leg on the ground, the other leg crooked over the first rung, arms crossed like he hadn’t a worry in the world as he looked across the Liffey. And I made a judgement. Based on what I was learning about business, I judged that the man was self-employed and that the young fella was his son. I assumed he was the best window cleaner in the world and that his clients, of which there were many, were very happy with him. So, what was the problem? Well, none really. Except for the fact that regardless of how good he was at washing windows, there were only so many windows he could wash in a day. His earning capacity was limited to his personal physical effort and was only sustainable should he remain fit for window washing. If it rains, he can’t wash windows, when it gets dark his earning for the day finishes, if he gets sick or takes a holiday, no windows washed, no income earned.